When you start to think that they really couldn’t come up with a new way to keep producing Star Trek merchandise, this fictional non-fiction travel guide pops up. And for the Trek fan who likes to own the slightly off-beat piece of memorabilia, this works. And I really loved this book. This isn’t going to be for just anyone, let’s be sure to recognize that. This is for the Trekkie who already has so much and enjoys the obscure Trek trivia. This is written and put-together like any sort of travel guide you might pick up in a book store if you were planning a trip to Europe or New York City or San Francisco, etc. It is full of ‘what to do, where to eat, where to stay, things to watch for,’ etc. For the planet Vulcan. In the future. …yeah…that’s pretty fun, actually. Writer Dayton Ward has clearly done his homework and a good deal of research to include a lot of (mostly) obscure references to things on the planet Vulcan. There are places or sites you would expect to see, based on episodes such as “Amok Time” and “Yesteryear” but when you see Diane Duane’s book Spock’s World (1988) or The Entropy Effect by Vonda N. McIntyre (1981) in the references section of the book, you can expect some pretty thorough research. The book does get a little repetitive, but that’s mostly because this sort of book isn’t meant to be read cover to cover, like a novel. Ward does well to mix it up and offer a little gem of some sort in each region that the book references. My favorite moments in the book are the section that states that there were Vulcans on planet Earth before First Contact, when a small scout ship crashed and had to wait for a rescue (I’m assuming this is from a show or book, but don’t know which one), and the sidebar on “Unpopular Vulcan Souvenirs” – “a list of tacky souvenirs to avoid when shopping on Vulcan” which include “anything with some variant of ‘Live long and prosper'” and “Fake Vulcan ears.” This seems kind of brilliant. I would love to have this book on my shelf and it is definitely going on my Christmas Wish List (yes…I have a digital copy, but this is the sort of book you really want to have a physical copy of in order to thumb through it). This book opens up a world possibilities (pun intended). Star Trek alone offers up so many planets and/or races that could have their own Hidden Universe travel guide. But I believe that the next one coming out is from a different universe altogether. In any case, this is a great concept with lots of potential. Looking for a good book? 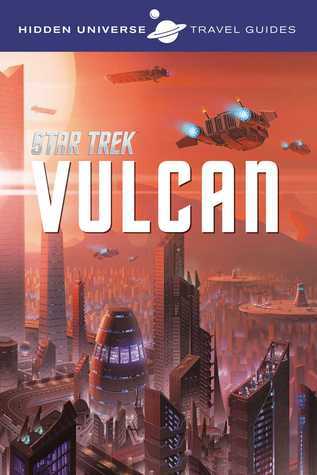 Start building your travel guide library right now with Hidden Universe: Star Trek: A Travel Guide to Vulcan by Dayton Ward. It’s fun and informative and filled with Trek trivia and an absolute MUST for any good Star Trek fan. I received a digital copy of this book from the publisher, through Netgalley, in exchange for an honest review. ← DARK SCREAMS: VOLUME FOUR – Brian James Freeman and Richard Chizmar, eds.